So you want to get started homebrewing, but not quite sure what you need? You’ve come to the right place. We’ve been through it and can help you decide what to buy to get started the right way. I won’t beat around the bush with this, it takes a lot of beer brewing equipment to get started with homebrewing. The good news is that the initial investment pays for itself quickly once you start brewing. After just a few batches, you equipment will have paid for itself. Each batch you brew will save you anywhere from $50-100 over buying a keg of a similar commercial beer. So, now that you’ve talked yourself into knowing that it’s totally worth it, let’s get into what you’ll need to get started homebrewing. I wouldn’t recommend that you buy each of these items separately. There are much more economical ways of amassing all of the required brewing equipment. One of those ways is to purchase a homebrew kit, which contains much of the home beer brewing equipment you’ll need to get started. But if you’re buying it slowly over time to spread out the investment, you can certainly pick up each of these items on their own. Another way to get started quickly with the equipment you’ll need is to buy a beer brewing system, which we talk about in great detail in another post. A 5-gallon fermentation vessel. You can go with a 5-gallon glass carboy or a plastic food-grade bucket with a lid, which is called a fermenter or fermenting bucket. Now, as I said before, there is an easy way to buy most of these items and that is as a complete beer brewing kit. Amazon sells a lot of great homebrew kits, and with the free shipping 2-day shipping for Prime members, there’s no easier way to get all of your equipment delivered to your door for a great price. Here are the top 4 homebrew kits I would recommend. After the chart, I will break down why I like these particular kits. If you’re looking for good, high-quality equipment, you’ll find that in each one of these homebrew kits. However, they’re all different in that they come with different items, which will make a difference based on what type of brewing you want to do. For instance, some of these kits include glass carboys, while others include just plastic fermenting buckets. One of these kits includes a starter kit for kegging, in case you want to skip right to kegging your beer (Highly recommended! See our guide on finding the best kegerator). Finally, there’s a kit for first-time brewers who just want to see if they like it first. You can always upgrade later. This is a great way to start. Northern Brewer is a well-trusted home brew supplier and they include a getting started in homebrewing DVD in the kit. The kit also includes a 6-gallon glass carboy for primary fermentation, a 5-gallon glass carboy for secondary fermentation, a bung & airlock for both, a siphon hose, fermenter bucket with spigot, bottle filler and tubing, a bottle capper and caps, carboy and bottle-cleaning brushes, One Step brewing cleaner and a carboy dryer. The kit basically includes everything you’ll need, except for a few things, the largest of which is a brew kettle or pot (which can add a hefty amount to the total. Here’s a good one you can add to your order. You’ll also need to get empty bottles if you want to bottle your beer. However, you won’t need to buy a starter recipe kit, because Chinook IPA recipe ingredients come included in the kit. 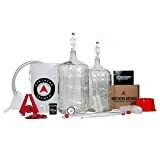 If you don’t want a lot of stuff to store, this probably isn’t the kit for you, because it comes with 2 glass carboys, which isn’t a necessity for a beginning brewer. In fact, we use mostly plastic fermenters and don’t really use our carboy all that much anymore. 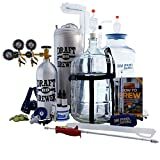 I think this is one of the best all-around brewing kits for beginner. For one, it includes the 5-gallon brew kettle so you don’t have to tack on another item to your purchase. Secondly, it includes two plastic fermenter buckets, rather than glass carboys. I personally prefer to use plastic fermenters for a number of reasons. They are easier to pour into and out of, way easier to clean, and if you drop one it won’t shatter into a million shards at your feet. Not including the two carboys in this kit also lowers the price to a more reasonable range for many newbies. Again, this kit includes most of the things you’ll need to get started. It has a 6.5 gallon fermenter with a lid and airlock, plus the bottling bucket with spigot AND the 5-gallon brew kettle. There is a bottle filler, an auto siphon, siphon tubing and holder, a bottle brush, cleaner and sanitizer. The kit also comes with a bottle capper and 60 caps. To get you started brewing, there is a Block Party Amber Ale recipe kit included. While the plastic fermenters are food-grade plastic and perfectly safe to use, I know that a lot of people just don’t trust plastic and would prefer to use glass. If that’s you, then this kit isn’t for you. This is the most affordable kit to get started with, and it also comes in a smaller 2-gallon size so you don’t have to jump right in brewing a 6-gallon batch. This is great for beginners who just want to try it out with a low cost investment, but once you decide to advance you’d have to purchase other equipment. The other drawback to the 6-gallon version of this kit is that all of the components are plastic, including the beer bottles that come with the kit, though they are PET-rated, reusable bottles. 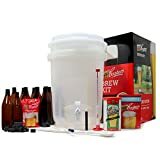 This kit includes an instructional DVD, a 6-gallon plastic fermenter with a spigot, a hydrometer and thermometer, a bottling wand, a beer mixing spoon, carbonation drops and a proprietary brew enhancer formula. There are 30 740ml resealable bottles included. Coopers has a full line of all-malt refill ingredient packs to make your beer. The included pack is a Coopers Lager. If you think there’s even a small chance that you’ll want to make this a real, serious hobby, then I would strongly consider going with one of the other kits to start. While Coopers makes it really easy to brew by including everything in a refill kit that you can literally just stir into water, it’s not nearly as versatile as other methods. If you wanted to switch to regular brewing, you’d need to purchase a brew kettle and a few other items. It’s also better, in my opinion, to use glass bottles with beer caps and in smaller format than these, especially if you don’t want to drink that much in one sitting. This is what we call the Mac Daddy of homebrewing kits. If you want to get set up in a serious way from the beginning, this is the way to go. Yes, it’s more expensive than other set-ups, but it’s also the most versatile and I think it will make you the happiest as a homebrewer. I say that because this kit comes with a kegging setup and once you’ve bottled your beer a few times you’re really going to want to switch to a kegging system. Why not just skip that part and go straight for the kegging? The Master Brewers Kit kegging components include a 5-gallon pin lock keg and an aluminum 5-lb CO2 tank for use with your home kegerator (check out our best kegerator recommendations). The keg system is fully assembled with all the guages you need. There’s even an analog refrigerator thermostat control. The equipment kit has two 5-gallon glass carboys with bungs and airlocks, a 5-gallon fermenter and lid, and three dual-scale liquid thermometers. You’ll need the included hydrometer and barrel thief to measure the gravity of your beer to be sure it is done fermenting. You’ll also get a funnel with strainer, an auto-siphon, siphon tubing, a carboy brush, and for cleaning a 2 oz PBW and 2oz Midwest Oxygen Wash.
One of the best beginner homebrewing books out there How To Brew, by John Palmer is also included in the kit, along with an instructional step-by-step DVD. For all intents and purposes this is the best all-around beer kit you can buy and it will set you off to a great start, because there are very few extras you’ll have to buy. You can even use this set up for all grain brewing. Instead of having to buy additional all grain brewing equipment once you’re ready for that step, you’ll already have everything you need. Of course, one of those big extras is a brew kettle (see below for recommendations). You won’t need bottles, a capper or caps, though, so that’s a bonus! If you’re really serious about giving this homebrewing hobby a try and you’re ready to get started, you can buy one of these kits with confidence. All of them are from reputable beer companies and are proven to be good equipment. The only choice you need to make is just how serious you’re wanting to be. I said at the start of this post that I would go over a few other items that you might need in the long run, so I’m going to include those things now. 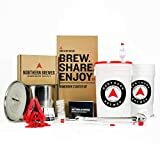 While the equipment listed above and included in most of these home beer brewing kits will definitely get you started on the right road, you’ll find along the way that there are additional things you’ll need or want. Some of those things are included in a few of the kits above, but not all of them. The first and most important part of homebrewing is cleanliness and sanitation. If you have an aversion to cleaning things thoroughly, you might as well just give up now, because homebrewing includes a lot of cleaning. If you don’t properly clean and sanitize EVERYTHING that comes in contact with the beer, you’re setting yourself up for failure and your beer for tasting like cardboard. Neither of those is a good thing. Here are four important items you’ll need for the cleaning and maintenance of your brewing equipment. My favorite two products for cleaning are PBW and StarSan. You’ll need the PBW to clean all of the equipment, especially the plastic fermenter which has had beer sitting in it for weeks. You’ll use the StarSan to sanitize everything, including your hands, before use. While most things will be soaked in StarSan in your sink, there are a few things that can’t fit into the sink or would be easier just coming into contact with the StarSan, rather than being submerged, and that is why I’ve included the spray bottles. Fill a spray bottle with the StarSan mixture and use it to spray down everything that can’t fit in the sink. Those are pretty self explanatory. Because of the trub (layer of sediment) and bulky hops that can be left behind in a carboy, you will absolutely need a good carboy cleaner that can scrape the leftovers off the glass. Just swishing water inside won’t cut it. For the bottles, it’s also very difficult to get the sediment off the walls of the bottle and they often need a good scrubbing with a brush, even if you’ve run them through the dishwasher. There are a few items you’ll want to purchase, just to make your life easier. Of course, these are not required items for homebrewing and you can get away without them, but you’ll be a much happier brewer if you have them. First up is a wort chiller. If you’re wondering if you absolutely need a wort chiller, try just once to cool the wort down to a reasonable degree in your bathtub with all the ice in your freezer. If you happen to have a sink that your 5-gallon brew pot fits in so you can constantly be filling it with cold water to cool down your wort, then you might not need the wort chiller, but in just about any other case, you do need it. You take the wort off your stove at roughly 212° and you need to rapidly cool it down to around 70-75 degrees so you can pitch the yeast. If you’re lucky and there’s snow on the ground outside, you could set the (completely covered and protected) brew kettle outside for a few hours and that might do it, but other than that, running cold water along the sides for hours, or sticking it in the bathtub and constantly filling it with ice, there is no other way to rapidly chill your beer without a wort chiller. The wort chiller cuts the time to cool down to roughly 20 minutes. Way better than 5+ hours. This handy thing will help you dry dozens of beer bottles in one small space. I’ve had 40 bottles drying upright on the counter for days before, waiting for them to be dry enough to store. It takes up a ton of space, and believe it or not, bottles don’t dry very well upright. This drying tree can hold up to 45 bottles at a time in the tiny amount of space it takes up. Definitely worth it. You’re going to need to take multiple readings of your beer along the way as it’s fermenting to check the gravity. I would not rely on knowing if your beer is done fermenting by watching the airlock activity. Most of the time, beer stops registering activity on the airlock around day 4 or 5, but that is no where near finished. Also, you might have a beer that has stunted yeast activity and has stopped fermenting prematurely. The only way to really know that for sure is to take a hydrometer reading. I would highly recommend getting two hydrometers, because you’re handing them when they are wet and if one hits the floor, it will burst into a million tiny bits and you’ll need a back up. As you’re preparing the water in your boil and then adding ingredients and boiling the wort, you’ll need to keep the water at specific temperatures for extended times. Without a thermometer, it’s impossible to really know the temp of your boil. I recommend a wired digital thermometer with an alarm, so you can set the pin in the water and have it warn you when the temperature gets too low or too high. I’m not sure why some of the beer brewing equipment kits leave the beer brewing kettle out of the kit. You obviously need one, or you have no where to actually brew your beer. The kettle is important, and so is the heat you use to boil it. If you’re working out of a small apartment like I am, you’ll have to fit your brew kettle on the stovetop, and hopefully that stovetop has enough power to boil so much water. Lucky for us, we had a power boil gas stove and it worked great to boil the full 5 gallons of water. If you don’t have that setting (or use an electric stove), you can boil as little as 1 gallon and add additional distilled water to the final process to equal a 5-gallon batch. If you don’t have a good set up inside your house, or you don’t want to brew inside, there is an alternative that works well for outdoor set up. It’s a brewing kettle that comes with a single burner stand. In any case, you’ll need to add a brew kettle to your purchase if the kit you’ve chosen doesn’t include one. Here are our favorite two brew kettles. If you have the space on your stovetop, this 30-quart stockpot will give you the volume to fit the whole 5 gallons of water for your boil, with extra space for boil over. It’s a sturdy stainless steel post with a tri-ply bottom for even heat distribution, meaning it’s less likely you’ll to burn extract that settles to the bottom. The glass lid has a steam vent, which is very important, so you don’t have to keep the lid propped open. If you don’t have the space for a larger pot, this 5-gallon brew pot is an economical and space-efficient option. Since it can only hold 5 gallons, you’ll only be able to boil a partial batch (up to 3 gallons), then add water after the boil, but for smaller spaces, that’s not a bad way to do it, if you’re only planning to do extract brewing. It’s not an industrial-strength pot, and it does have some limitations (one being that the lid doesn’t have a vent and you can’t see what’s going on inside), but it will definitely get the job done. The final piece of advice I can give about the equipment needed for homebrewing is to read, read, read. You’re lucky if you know someone who is already a homebrewer and can impart his knowledge in person, during actual brew sessions, but that is not the case for most of us. You’re going to need to continually be reading and learning about the process. A good start can be found in many of these books. I have many of them and have read them many times. You can also take to the internet and forums for answers to your questions, but there is no substitute for having these books on hand. There are a lot of them, but they’re all very good and useful. I especially recommend How to Brew as the first book you read about homebrewing. It’s indispensible. Secondly, the Clone Beers recipe book has been the source of many of my recipes over the years. It’s easy to follow and a lot of homebrew shop owners know the recipes and can help you with ingredients or suggest changes. We’ve also written about the top 10 homebrewing mistakes, in case you want to avoid those pitfalls! Whatever direction you go with your home beer brewing kit, I hope you find a method that works for you and that you enjoy enough to keep using it. Homebrewing can be very rewarding (and addictive!). If you need help picking out products, shoot us an email or leave a comment.